Christopher Wool, Untitled, 2018, bronze and copper plated steel. Photo: Bryan Zimmerman. Christopher Wool's "Untitled" is currently on view at Art Omi. 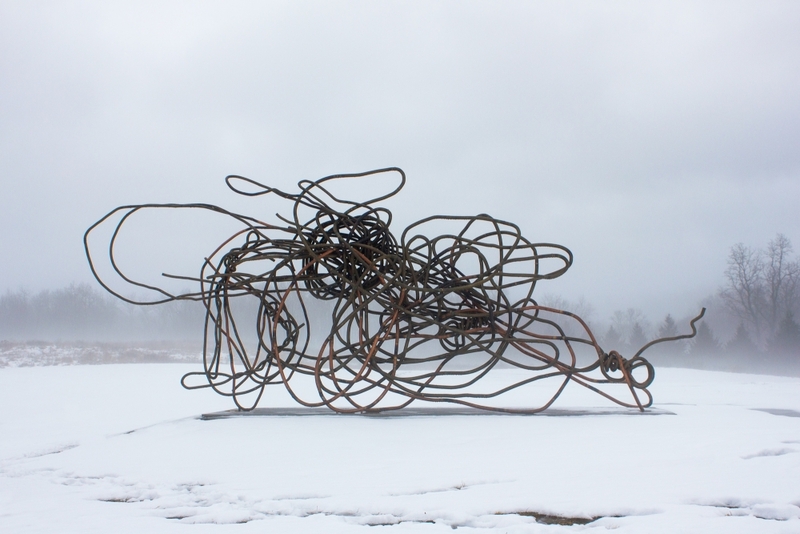 Untitled is a large-scale bronze and copper plated steel sculpture, exhibited outdoors for the first time at Art Omi. In the past few years, Wool has cultivated a sculptural practice that intersects with his more widely known two-dimensional body of work. The sculptures demonstrate his penchant for appropriating existing forms, deriving their structure from ranching wire found around his property in Texas. The structures are uniquely defined by their coiled and twisted lines, evoking the silk-screened and spray painted contours found in the artist’s earlier two-dimensional work. For more information, please visit Art Omi's website.